This is the ea siest way to spot the station. ISS Detector will tell you when and where to look for the ISS. You get an alarm a few minutes before a pass. You will never miss it. ISS Detector will also check if the weather conditions are right. A clear sky is perfect for spotting. 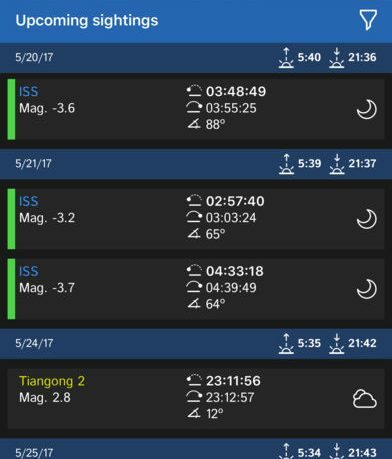 The Chinese space stations Tiangong 1 and Tiangong 2 are also tracked. Extensions will enhance the functionality of ISS Detector. With an in-app purchase you can add many famous satellites and amateur radio satellites. See the Hubble space telescope, rocket bodies, Vanguard 1 and many bright satellites. Radio Amateur Satellites: Track dozens of ham and weather satellites. Famous Objects: Track Hubble Space Telescope, rocket bodies, bight satellites and more. 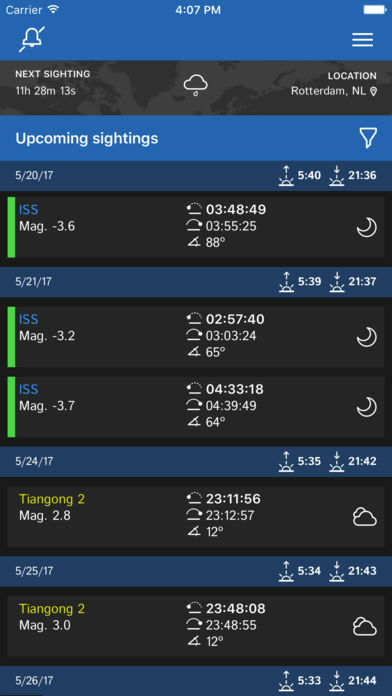 Upon opening the ISS Detector app, you will see a schedule of upcoming sitings for the International Space Station as well the Chinese space stations Tiangong 1 and 2. 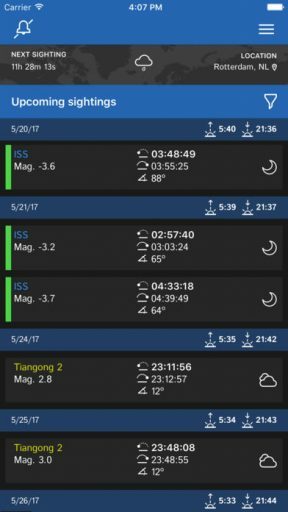 The sitings are listed in order of date with details including start and end time, weather conditions, and maximum height and magnitude of brightness. They are also color coded, with green indicating a good pass and orange being one with less quality. Notifications can be toggled for sitings of your choosing, so you don’t miss an upcoming event. 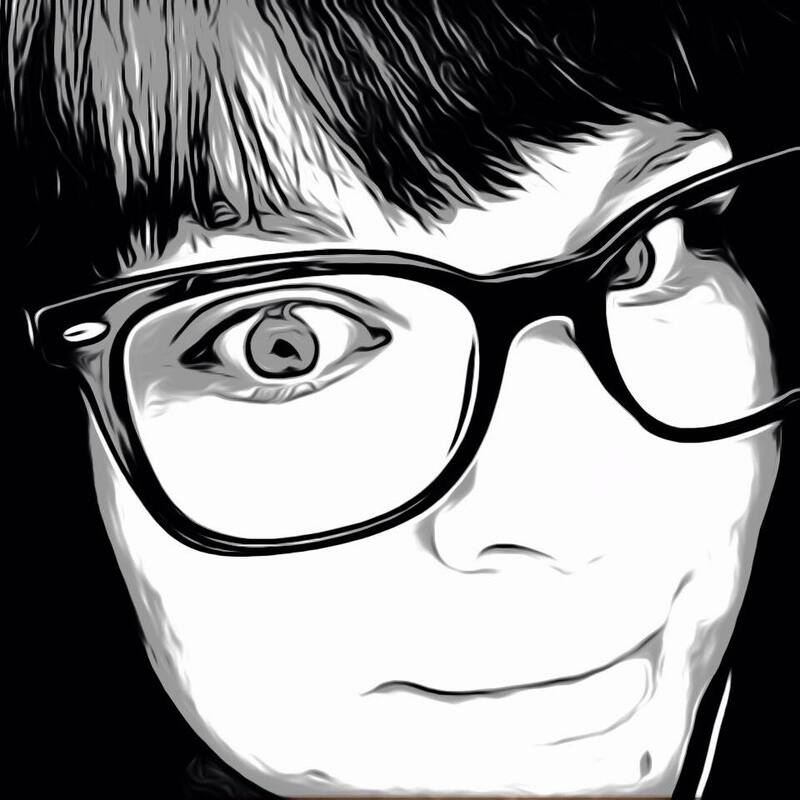 There are multiple ways to view the ISS, including a radar mode, map, and my favorite, an augmented reality mode that can be enabled with permission of the use of the iPhone’s camera. The details screen provides a map indicating the satellite’s location with longitude and latitude with other coordinate information of the current position. Opening the camera is an easy way to point your device to the sky and see just where the station is in relation to your location and know precisely where to look. This app is very informative. At first it is a little overwhelming, but the Help menu to the right includes explanations of every screen and what each indicator means, making it easy for even an amateur tracker to understand. It is very easy to navigate and use. ISS Detector does include full screen ads occasionally but they are easily disabled and very minimal. Additional objects like the Hubble Space Telescope can be added to the tracking schedule with in-app purchases, which includes ad removal. Never miss another pass in the sky with ISS Detector. The app is available now on the App Store for free.